It's more than the white sand beaches, mesmerizing turquoise waters and the breathtaking sunsets that seem to light the whole sky on fire. Negril's famous Seven Mile beach is also known for the enviable laissez-faire attitude that embraces this stretch of the Jamaican coastline. Sands as soft and white as powdered sugar as far as the eye can see; water that’s always perfect and flat; the best humidity in Jamaica, fanned by fresh east breezes—make this one of the most celebrated beaches on the planet. Perfectly chic and ever-so-playful, Sandals Negril Beach Resort & Spa is set on the longest stretch of Jamaica's famed Seven Mile Beach. With an ambiance that perfectly melds relaxed tropical luxury and barefoot elegance, Sandals Negril was created to hug its seaside location to make it a true beachfront resort. Incredibly tranquil waters lend themselves to all manner of watersports, from swimming to snorkeling and kayaking. Six restaurants that offer savory cuisine ranging from the West Indies to the Far East are set along - and even on - the beach, so every seat offers a view of Negril's legendary sunsets. 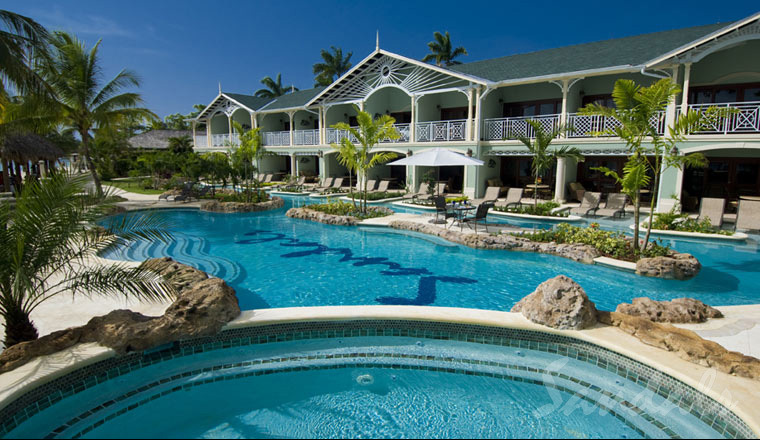 Located on the far western tip of Jamaica, 1 hour and 10 minutes from Montego Bay International Airport. 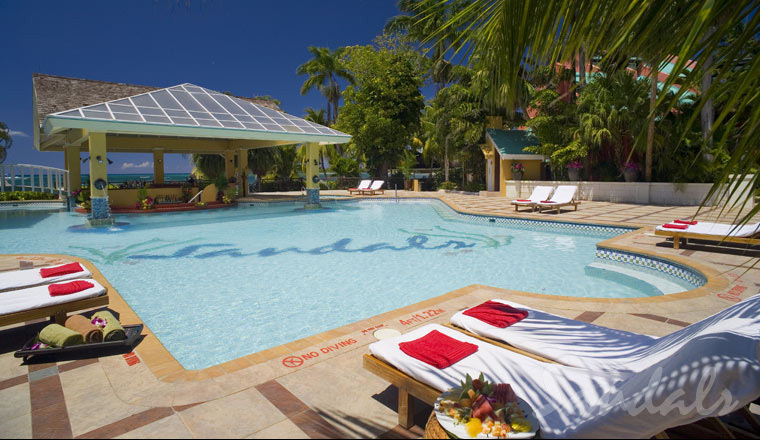 SandalsNegril Resort is far from ordinary and even further from any care in the world. It's the exotic side of the island. 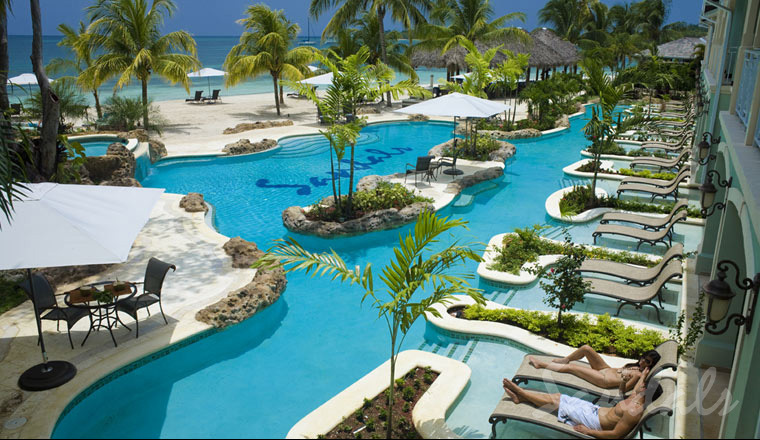 And the ultimate side of Negril is definitely Sandals Negril Beach Resort & Spa. Sandals Negril Beache Resort & Spa is set on the longest stretch of Jamaica's famous seven-mile beach, this elegant yet laid-back resort is the only one in Negril with a full European spa, (Spa services additional) 6 restaurants plus full exchange privileges at nearby Beaches Negril, 24- hour room service for guests that reserve a suite concierge room or suite, unique beachfront suites, Swim-up Crystal Lagoon suites, Millionaire Plantation Villa and the Sunset Loft Suites. Endless land and watersports from a sports complex to incredible scuba diving! 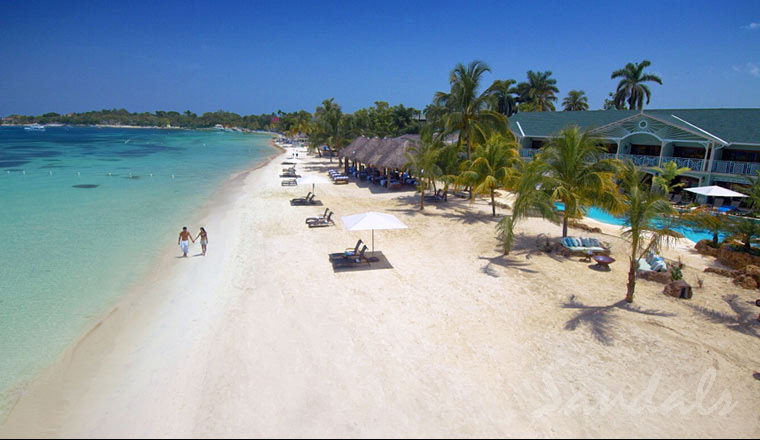 Sandals Negril Luxurious yet laid-back and slightly wicked, Sandals Negril Beach Resort & Spa is "The Beach Resort" all others aspire to be. Situated on the most sought-after stretch of Jamaica's famous seven mile beach, there's no place better to just kick-back and enjoy the rhythm of life. Always on the leading edge of innovation, now Sandals puts you even closer to the water's edge. Introducing the new Beachfront Swim-up River Suites at Sandals Negril, where the magic and allure of water soothes and renews. 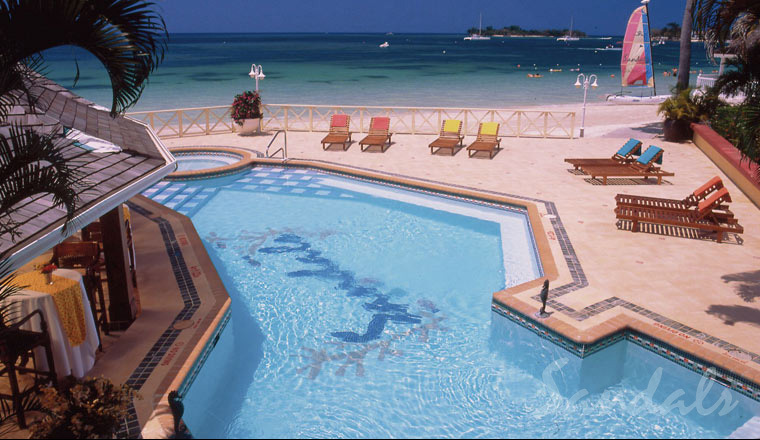 On one side, your suite is nestled on the longest and best stretch of Negril's famous seven-mile beach. On the other side, you'll simply step from your zero-entry patio into a winding river that lets you "go with the flow" of romance and adventure. These wonderful suites feature a secluded patio surrounded by lush Caribbean vegetation that opens onto the resort's lazy river, where lovers can dip their toes into the soothing waterway. Relax on the expanded patio area with lush vegetation, and access to the lazy river just steps away. 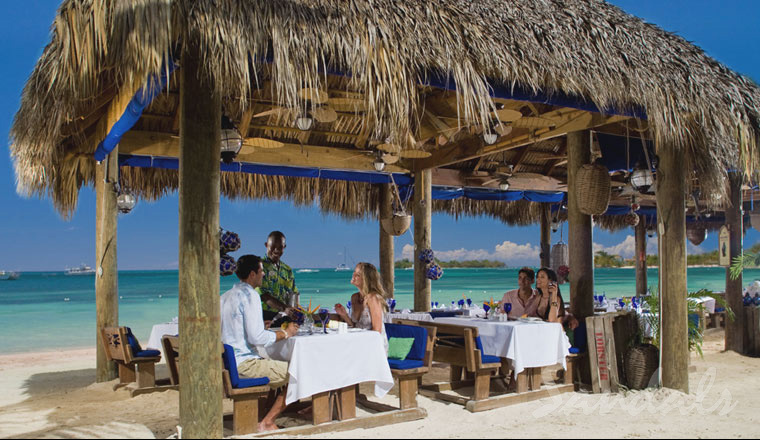 The patio features an outdoor dining area for the ultimate in relaxation under the warm Caribbean sun. Indoors, the suites feature the ultimate in luxury, with a four-poster mahogany bed. The marvelous bathroom is graced with marble and hand-cut mosaic tile accents, plus a Jacuzzi tub and his and her vanities. - The seating arrangements for the Sundowner and 4C's restaurants have been changed. At the Sundowners, guests now have the option of dining under the stars on the nearby beach instead of the top section of the restaurant. This provides more intimacy and privacy for couples as well as more specialized and personalized service. 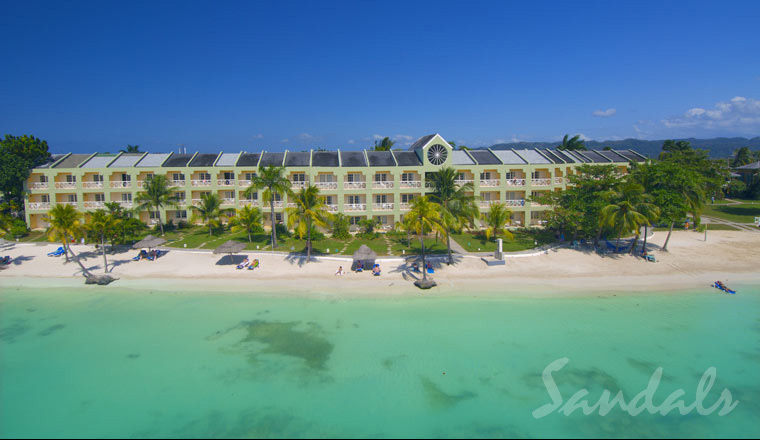 - Sandals Negril Beach Resort & Spa has been busy touching up the Squash and Racquet Ball courts with repainted walls and a renovated roof. - Now you will be able to relax on the beach at Sunset to the soothing sounds of a Saxophonist. - Cocktail service has been introduced for guests while spending time around the pools and beach area. - A cigar booth with hand rolled Jamaican cigars (for sale) are being introduced. - Watersports has acquired a new Mastercraft ski boat.